On this Friday cooking, I took it more relaxed and let my Taiwanese friend do the cooking. I redid Summer Berry Medley, excellent after a series of spicy dishes. This dessert is a real reliever. As some of you voted to see more Asian food on this blog, here is a series of 4 quick and easy Asian dishes. The first of four dishes is the corn and crab meat soup. This shortcut soup can be found in many Chinese menus. 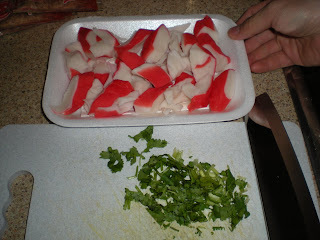 If you have fresh crab meat, go for it! 1. 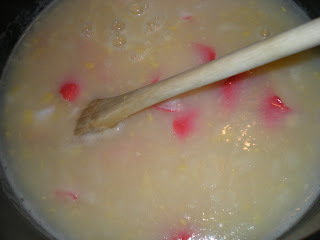 In a medium soup pot, combine stock and sweet corn over high heat until boiling. 2. Add crab meat and turn to medium heat. Let it cook for 8 mins. 3. Remove from heat. Add eggs and stir into pot to form ribbons. Add salt and pepper to taste, and top with coriander. Serve.